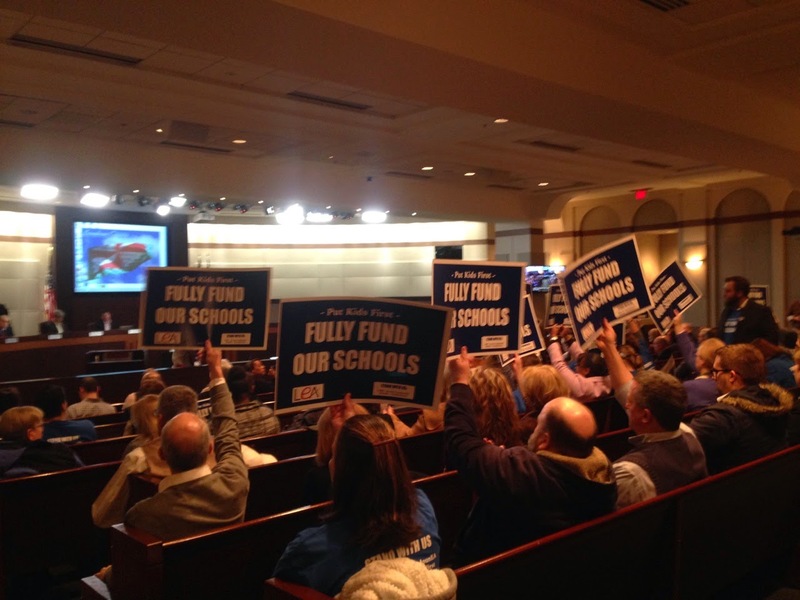 Support Our Schools - Loudoun: Two down, one to go! 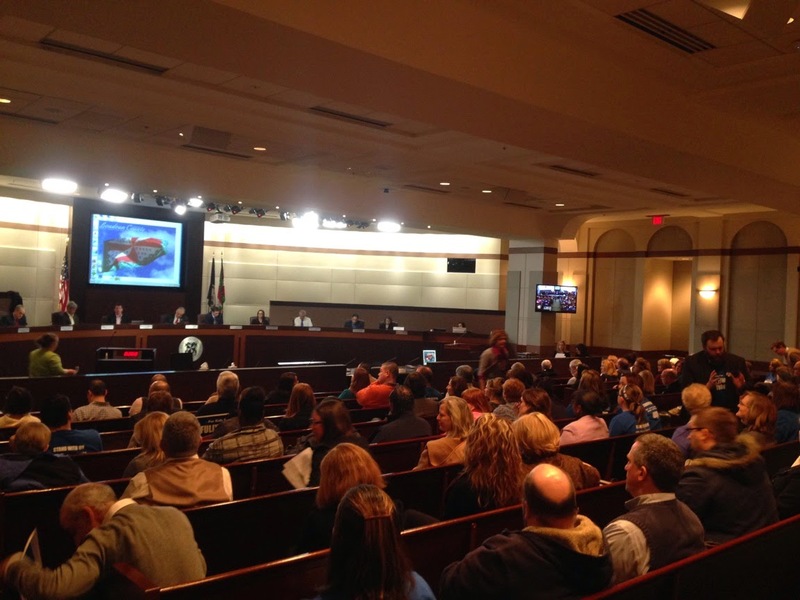 Turnout was great for the first two Board of Supervisors budget public hearings yesterday. At the first session at 3pm, five of the nine supervisors were in attendance, and eleven people spoke. Speakers were excellent. Ten spoke in favor of fully funding the schools budget and one spoke in favor of needed library services. Two Sully Elementary teachers, Melissa Muszynski, who spoke in Spanish followed by Sandy Sullivan, who translated in English, spoke for the at-risk students affected by the cuts last year who would benefit from the restorations and improvements in this year's budget. Candidate for Algonkian Supervisor Andrew Resnick's speech explaining that supporting schools is good for all citizens of Loudoun County received so much applause Chairman Scott York admonished the crowd to keep it down so people could hear him read the speakers' names. Sugarland Elementary's Patricia Caldwell-Wilson, who is back in the classroom as a second grade teacher after her position of math specialist was cut last year, spoke strongly in support of our schools sharing her experiences not only as a teacher but as a parent and Loudoun County resident. Lisa Carter, a parent of two LCPS students and a former LCPS teacher, spoke in favor of fully funding the budget in order to ensure the expansion of full-day kindergarten is implemented. Peter Rush, one of Loudoun's elected Soil & Water Commissioners, urged the Board of Supervisors to consider the community's stated priority of school funding over tax cuts. Both hearings should be online soon at http://www.loudoun.org/webcast. You can check them out there. Budget Season is in full swing, and once again the School Board's adopted budget cannot be fully funded without tax increase. This Board has held the line on taxes consistently, but it is difficult to keep up with increasing enrollment and demands to educate our kids. More students means you need more schools, more teachers--both capital and operating costs go up. The School Board's proposed budget, at $1.3 million more than the Superintendent's budget, would require $661 million dollars of County Transfer Funding. So, in order to keep the average homeowner's tax bill from going up, the Board of Supervisors this April would have to set the tax rate at $1.13, which is about 2 cents less than it is today. However, in setting the rate at that rate, the School Board would likely have to cut about $25 million from its proposed budget during "reconciliation"-- unless the Board cuts something on the "general fund" side, which finances public safety, social services, parks, recreation and other "non education" services. Just so you know, $1.165 is what is being advertised as a possible tax rate, but I seriously doubt my colleagues would support this -- nor would I. While some may say that Loudoun County residents can easily afford another $160 per year, let's remember that this is an AVERAGE TAX RATE INCREASE, and many whose homes appreciated significantly in value will pay a lot more. In addition, our County has seen a growth in lower income residents -- exemplified by the fact that we now have more Medicaid beneficiaries than Arlington. Sequestration has taken its toll, not just on federal employees and contractors, but owners of commercial properties that are sitting vacant. We must not forget that not ALL Loudoun taxpayers can shoulder big jumps in taxes from year to year. Also, based on conversations I have had with School Board members, they believe they can rectify some of the spending differentials. However, I must say that I do not want to see a $25 million cut. Last year, the School Board went through a bloody reconciliation due to a $35 million shortfall, and I do not want to see that again. But I am keeping an open mind on the tax rate and spending as we proceed. Post by Ken Reid for Leesburg, VA. If you spoke yesterday, be sure to email your supervisors your comments as a follow-up. We have one more budget public hearing this Saturday at 9am at the School Administration building in Ashburn. Call (703) 777-0204 to sign up to speak in advance or sign up when you get there. You can sign up as long as the hearing is still in progress. Come out and join us!